Tilt and turn windows are the ideal window choice for modern life. They offer two versatile opening options – tilt (where the top of the windows can be opened slightly), and turn (where the windows can be opened fully). These two features make for an easy lifestyle – you can even clean the outside glass from the safety of inside, removing the need for dangerous ladder balancing. If you have a young family and more than one storey, you can also benefit from safety reassurance – enjoy a cool breeze from the tilt function, without the risk of children falling. With standard windows you wouldn’t want to leave the whole entrance open – this may attract burglars, or put children at risk. Fortunately, tilt and turn windows’ innovative dual functionality completely removes these risks – and makes for a well ventilated property and more pleasant living spaces. 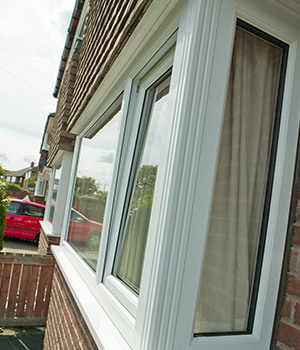 Whether aluminium or PVC-u, tilt and turn windows from Team Frames Trade & Retail will enhance your property with thermal performance, style and security. Incorporating energy efficient glazing and innovative frames, tilt and turn windows help to remove draughts and cold spots. Combined with multi-point locks, you can also gain peace of mind in terms of safety. Our aluminium tilt and turn windows are available in any powder coated RAL colour, and our PVC-u in a range of contemporary and more traditional shades, including Cream, Chartwell Green, Black, Grey, Rosewood, Irish Oak and Light Oak. Why choose tilt and turn windows from The Adorn Range?